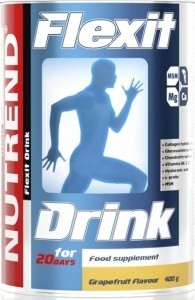 NUTREND Flexit Drink - Joint nutrition with complete composition. FLEXIT DRINK contains glukosamine sulfate, chondrotine sulfate, collagen proteins and peptids, amino acids, MSM, hyalurone acid, agents restraining otheoporosis occurance: calcium, magnesium, vitamins. FLEXIT DRINK - for replenishment and enrichment of nutrition in case of joint problems, for individuals under risc of joints abrasion and exertion (during sports, overweight), individuals with limited mobility or joint tireness, women as a prevention of ostheoporosis, individuals with insufficient uptake of calcium. Glucosamine is a body's natural substance, which is produced in the body from the blood sugar. It is important for the mobility of joints; it plays a crucial role in connective tissue synthesis, it reduces catabolic processes in joint cartilages. Glucosamine is the precursor of chondroitin. Chondroitine sulfate – is a basic building block for connective tissues formation and repair. Its sufficiency protects cartilage from destruction and damage. Scientific studies showed that chondroitin sulfate is a natural, alternative nutritional supplement for arthrosis. The addition of selected effective substances considerably improves effectiveness of gelatin hydrolysate and chondroitin sulfate and finishes the highly effective composition of the product. Hyalurone acid – in the cartilage it is a chief component of the intercellular matrix - joint fluid, which it provides with softness, elasticity and viscosity. A molecule structure of hyaluronic acid causes its ability - even when the concentration is low - to bind many water molecules by forming a viscous gel, which gives the connective tissue the ability to resist external pressure. MSM (methylsulfonylmethane) – is an organic sulfur compound, which is commonly present in human body. It participates in formation of collagen fiber structure. Due to its antioxidant activity it assists in protection of cartilage from damage caused by free radicals. Sulfur in MSM helps form basic amino acids like methionine and cysteine. L-Proline – an amino acid absolutely necessary for collagen formation, it speeds up regeneration of damaged cartilage and ligament. Vitamins C, B6, D3 – they support vital functions, stimulate curative processes and contribute to the body's immunity. Magnesium – works together with calcium, is necessary for nerve and muscle activity, so called “antistress” mineral. For Protection Of Existing Connective Tissue: Once A Day 10 G, In The Morning On An Empty Stomach. In Case Of An Increased Wear And Tear And States Of Damage: Once A Day 20 G, In The Morning On An Empty Stomach. Children Of 6 Years And Older: 5 G A Day. Encourage Increased Intake Of Fluids! Do Not Exceed Recommended Dosage. Put The Appropriate Amount Of Powder In A Small Amount Of Non-Saturated Water, Stir And Then Complete To A Required Amount. After C. 5 Minutes The Solution Is Purified And Gel Particles, Formed By Hyaluronic Acid, Are Apparent. Once Opened, The Product In Containers Should Be Consumed Within 30 Days And Stored At The Temperature Of 10-25°C. The dilution ration: 20 g into 250 ml of water. Before using this or any other dietary supplement, as well as before you start training program, consult your physician or other expert. Keep out of reach of children. Do not exceed recommended dose. During use of the product consume enough water. 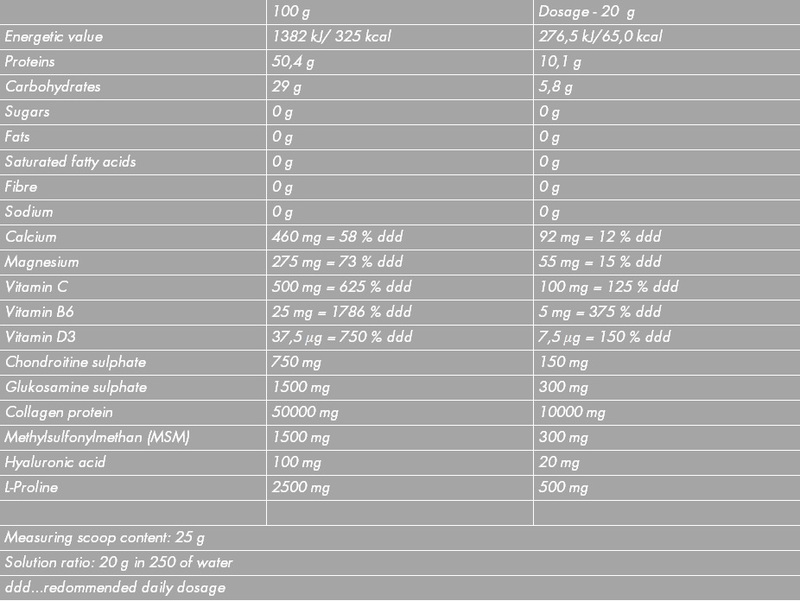 Do not use a dietary supplement as a substitute for a varied and balanced diet! This dietary supplement is not intended to diagnose, treat, cure, or prevent any disease.